Review: The hunt for the 39 clues has taken two kids (brother and sister) on a ride for their lifetime in the 7th book in the 39 Clues series titled The Viper’s Nest written by Peter Lerangis. 14 year old Amy and her brother Dan age of 11 have just seen a woman die, their wanted by the Indonesian police, and their trapped on an island with a guy named Alistair Oh who know TOO much about Dan and Amy’s parents death! And to make matters worse a tropical storm is rolling in! Just when they think everything is going to be ok, it gets… EVEN WORSE! Now Dan and Amy have to sneak into a Tomas stronghold (HQ), and try and get the clue that Winston Churchill left alone that NO Cahill has ever found! But even after all that, there is still one more thing that Amy and Dan have to discover, the rattling truth about their family branch! All this is written by Peter Lerangis, one of the many authors, contributing their time, and writing the books of the crazy wild-goose chase of the “39 Clues”!!! 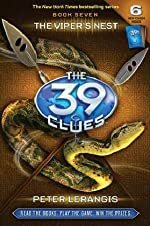 This is the best 39 Clues books I’ve read so far because of 2 things: the suspense and action! No other book or even series have I read contains so much action! For example, when Amy, Dan and Alistair wake up coughing in the burning house on the remote island in Jakarta. My favorite part in the book though is when Dan gets burnt badly by the acid while trying to flee the Kabras! The character setup in this book was phenomenal! Just like all the others in the series, it is just as amusing and intense! Plus, this book was taken place in Africa which was very cool. This book is 7th in the series, and there are 10, so I’m so close to finishing the series! I rate this book a 10 on a scale of 1 to 10, 1 being the worst, 10 being the best! Not many people know the 8th books, name, but I do, but you will have to wait and find out for yourself!!! We would like to thank Scholastic for providing a copy of The Viper's Nest for this review. Have you read The Viper's Nest? How would you rate it?